Part of our mission at Fairview Lake YMCA Camps is to foster a healthy mind, body and spirit in all of our guests. Creating special weekends to promote wellness, leadership and health help us do just that! With partnerships from local health providers, our sister YMCAs and friends of Fairview Lake, we can offer dynamic programs that inspire healthy living and wellbeing. Adult weekends are for individuals ages 18 and older. $165 per person for the weekend, $85 for Saturday only. Women’s Wellness Weekend is a great way to try new things and meet new people in a beautiful setting. 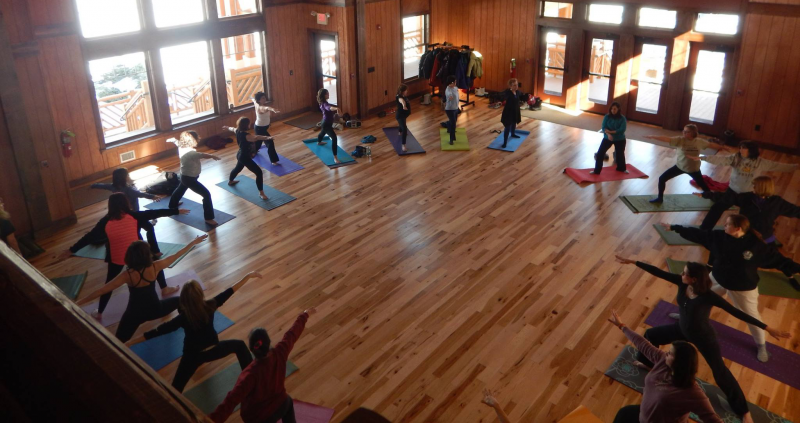 Join us for massage therapy, yoga, hiking, meditation, crafts, dancing, adventure and fun! You will have the option to engage in high- energy activities or just sit by the fire with a good book - the weekend is framed to satisfy every need. The Appalachian Trail is calling! Arrive in the evening to get to know your fellow adventurers. In the morning, you'll hit the trail with our trained staff on a twelve-mile backpacking trip with an overnight at Buttermilk Falls. You'll spend a night in a tent and cook your own meals while on the trail. Don't have backpacking gear? We can help to outfit you for your adventure. We will teach you how to cook over a camp stove or fire, and provide food and snacks while on the trail. Tents provided. Recharge and center yourself as summer begins in this relaxing weekend retreat. We'll have yoga, meditation and other workshops for your enjoyment. Get out there! Arrive in the evening to get to know your fellow adventurers. In the morning, you'll set out for the river where our trained staff will guide you on a 19-mile paddle down the Delaware River. We'll camp at a riverside campsite on the Delaware; canoes, paddles and PFDs will be provided. We will teach you how to cook over a camp stove or fire, and provide food and snacks while on the river. Tents and dry bags are provided.